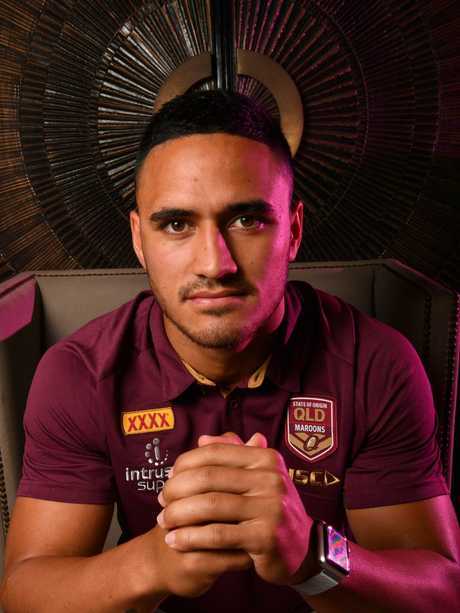 Valentine Holmes admits he is "risking everything" by walking out on a $5 million NRL contract but insists he has no fears in his bid to become an NFL superstar, declaring: "I'm not planning to fail." 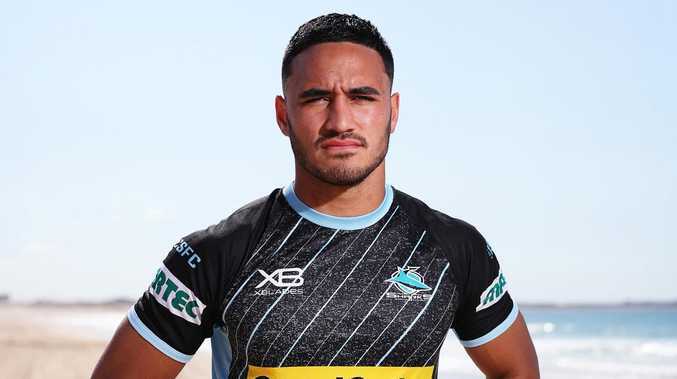 In his only interview following his bombshell decision to quit the Sharks, Holmes said he was so determined to succeed in America there is a chance he may never return to the NRL. "I am 100 per cent committed to making the NFL," Holmes said. "I wouldn't be risking everything if I didn't think I could make it." The Sharks reluctantly agreed to release Holmes to pursue his NFL dream on the condition the Queensland Origin star could not play for a rival club if he returned to the NRL next year. But Holmes has no intention of being an abject failure in America as he attempts to emulate Jarryd Hayne and 150kg monster Jordan Mailata by making the final cut for a 53-man NFL roster. Three months ago, Cronulla tabled a five-year upgrade worth $5 million with a view to making Holmes a Shark for life. Instead, the 23-year-old will depart for America in January to train for nothing at the world-famous IMG Academy in Florida - home to the NFL's International Player Pathway Program. Holmes will enter the program with no concrete guarantee of a formal contract. His shock defection comes almost two years to the day that Holmes and Cowboys star Jason Taumalolo flew to Los Angeles for the two-hour workout before pro scouts that ignited the Sharks flyer's American dream. "It's the hardest decision I've ever had to make," Holmes said. "I'm not scared or nervous, I'm feeling pumped right now. "Obviously I love rugby league, the Sharks and all of its fans, but for me, this is more to do with the challenge of making it in the NFL. "Ever since that workout I did (in Los Angeles) I've loved the sport and I want to see if I have what it takes to make it. "People will say it can't be done but I'll believe in my ability and I am backing myself to play in the NFL. "The timing is right. I believe I am at the right age to give me time to learn the game ... it is basically a now-or-never situation." Holmes only finalised his decision last Saturday when his management team informed Sharks powerbrokers. The Maroons ace is considering two positions in his new sport - punt returner or slot receiver. The latter position has become one of the most important in the NFL, with slotbacks required to have speed and evasion to make explosive incursions through the middle of rival defences. The NFL's International Program is designed to unearth talents from other nations. Holmes will train 84 hours a week in Florida in the hope of clinching an international exemption with an NFL team. International graduates placed with an NFL team cannot be cut for 12 months to give them time to learn the game. Should Holmes clinch an NFL berth, it means he is safe for at least a year - effectively ruling out any chance of him returning to the Sharks next season. Hayne's stunning NFL odyssey lasted just eight games with the San Francisco 49ers in 2015 but Holmes is determined to be a long-term success story. "I'm going over there for three months initially, but I'm not looking at this as a quick experiment. I'm not planning to fail," he said. "I feel like I've achieved a lot in the NRL. I've won a premiership. 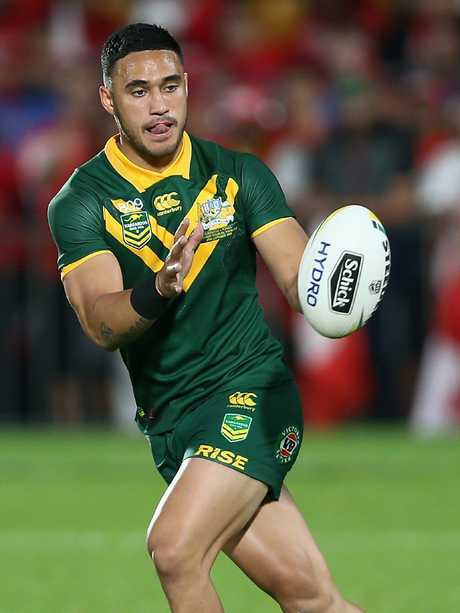 I've played Origin and Test football and won a World Cup, so while I had no issue staying in the NRL, I wanted to challenge myself as an athlete. "I love watching NFL, they are freaks over there. "I know I'm stepping out of my comfort zone. The playbooks are a lot bigger and I will have a lot to learn, but I think I'm a good learner." Holmes' agents Chris and Gavin Orr from PSM Agency, who helped deliver Mailata to the NFL, said the Cronulla sensation was under no pressure to quit the NRL. "It was a massive decision for him," said Chris Orr. "We wanted to ensure Valentine knew what lay ahead for him before he made the decision."